rec. March, April 2015, Kirchenzentrum Kronsburg, Hannover. This is one of Cybele’s SACD that works in 5.0 surround-sound, standard stereo, and also with a 3D binaural layer which is very appealing to veteran headphone users such as myself. Fritz Siebert plays on a 1999 harpsichord made by Burkhard Zander based on a two-manual seventeenth century Ruckers/Couchet model from Antwerp. This has a bright sparkle to the sound but with a satisfyingly punchy bass which suits this programme very well. The booklet has a photo of the recording session, and if you play this disc in, for instance, standard stereo as opposed to binaural, you receive a distinctly different perspective on the sound – the standard microphones delivering more of the acoustic at a greater distance from the instrument. This may be preferable to some, even on headphones. The multi-sectioned Toccata in D minor BWV 912 pretty much has it all when it comes to demonstrating this instrument’s qualities. Recorded fairly close but not uncomfortably so in a respectably spacious acoustic, Fritz Siebert plays with brisk energy and expressive breadth, keeping everything close to what you might expect as standard performance practice and none the worse for that. The French influence in the Suite in E minor that dates from Bach’s time in Weimar allows for more interpretational freedoms but again there are no big surprises. I like the way Siebert holds notes down to heighten the legato effect in the Allemande, exploiting the resonance of his instrument and keeping ornamentation to a tasteful minimum. The Sarabande is the central expressive keystone to this piece and an oasis of gentle elaboration here, settling our spirits before launching into a Bourrée with plenty of momentum and no brakes, and a kindred spirit in the final Gigue. The Prelude and Fugue in A minor, BWV 894 is almost certainly another work from Bach’s Weimar period and “among the most concise examples in the entire virtuoso literature for keyboard” according to the performer in his booklet notes, thankfully printed in German and English translation. The intense density of notes spins around your ears in the swift tempo of the Prelude, and the accompanying Fugue is a remarkable 5 minutes in which the virtuosity of the composition is as breathtaking as the performance. From the first part of Bach’s Clavier-Übung, the drama of the Partita in D major BWV 828 makes for a welcome change of mood, and perhaps one in which a little more space in terms of tempo might have been taken in the opening for the Ouverture. We are kept very much on our toes however, and as the energy of the main section takes over the proportions chosen soon click into place. This substantial work also has plenty of inner contrast, with a more transparent stop setting for the Allemande, allowing firmer resonance for the Courante and a further adjustment for tonal mellifluousness in the Sarabande. 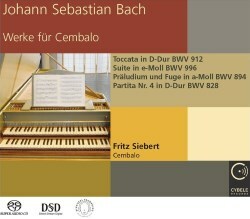 Many recordings these days appear on piano, but there are of course numerous harpsichord alternatives for Bach’s music. I had a listen to Lisa Goode Crawford’s Partita No. 4 on Naxos 8.572309 from 2010 and still quite enjoy this version with its more intimate recording. Fritz Siebert is a touch more flamboyant in his faster movements and explores greater expressive depths in the Sarabande and elsewhere, so wins the laurels in this admittedly rather superficial comparison. For its sonic richness, unpretentious readings and little touches of nuance and detail Fritz Siebert’s Bach recital has gone very high on to my list of harpsichord favourites.